By Geoff Carmody - posted Tuesday, 15 May 2018 Sign Up for free e-mail updates! The commentariat has worked itself into a lather about the competing income tax policies proposed by the Government in its 2018-19 Budget and the Opposition's reply thereto. 'Bracket creep' came in for a lot of attention – if not actual policy to deal with it. One headline screamed 'ScoMo stops the creep'. He didn't. The Opposition ignored it completely. Can we 'stop the creep'? What is it? It's not just about rising incomes pushing taxpayers into higher marginal income tax brackets. With a 'progressive' income tax scale, and fixed $ values for tax bracket thresholds, a taxpayer's average tax rate increases for every extra taxable dollar received. 'Bracket creep' is quantified by comparing average income tax rates, where tax thresholds are adjusted for wage increases, with those where they're not. See Chart 1. 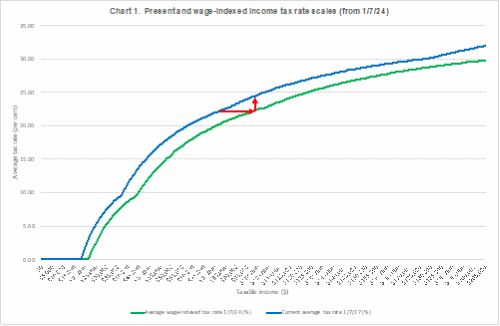 As Chart 1 shows (see arrows), increasing taxable incomes increase taxpayers' average income tax rates unless the rate scale thresholds are automatically increased as incomes increase. The arrows show that, for somebody earning about $82,000pa now, with forecast wage increases from 2018 to 2024, incomes would increase by about 19.5% to about $98,000pa. Without tax bracket indexation, the average personal tax rate for that taxpayer automatically increases by almost 10%. 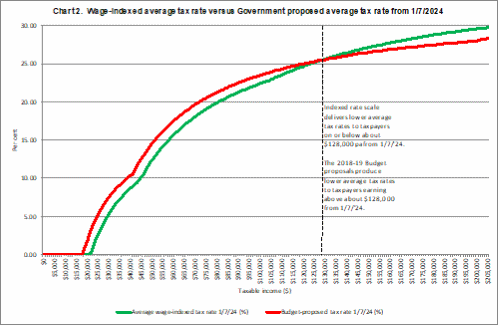 Indexation of $ tax bracket thresholds to wage increases would 'stop the creep' permanently. Major parties don't advocate tax bracket indexation. 'Bracket creep' revenue is used more selectively. See Chart 2. As Chart 2 shows, the Government is proposing tax cuts greater than tax bracket indexation for taxpayers receiving more than about $128,000 from 1 July 2024. For everybody else, rate scale tax cuts are zero (on incomes from $0 to $37,000), or less than full tax bracket indexation (on incomes from $37,000 to about $128,000). Under Labor, 'the creep' hits all taxpayers. Its Budget reply leaves the current income tax scale in place, giving 'bracket creep' full revenue rein. 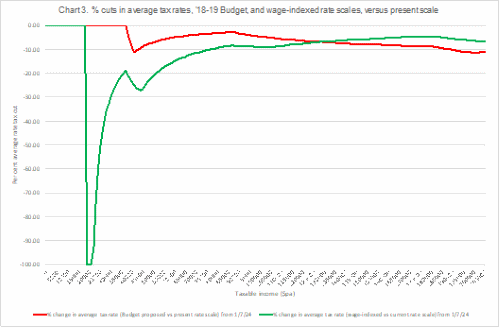 Comparing the percentage tax cuts from an indexed rate scale and the scale in the 2018-19 Budget, clearly the former delivers much larger % cuts below $128,000pa, and especially at the lowest taxable income levels (at least where tax is actually payable). An indexed rate scale delivers smaller % tax cuts in 2024 for those on incomes above $128,000.